Dangling feet, poor feet posture, or feet that stay still for hours on end as you work can all cause undue blood to pool in your lower limbs. The result is increased stress and strain on local muscles, ligaments, and tendons, all of which can result in pain as nearby nerves are compressed. Unnecessary pressure will even eventually migrate to the back that can cause debilitating back pain. This is where an ergonomic footrest can really save the day. Ergonomic footrests, which are usually placed under the desk, allow shorter people to plant their feet on a firm surface as they sit. The design of the footrest also promotes active sitting in all users using a rocking motion, which is highly beneficial for blood circulation and muscle tone, and prevents foot pain caused by a sustained and static position. 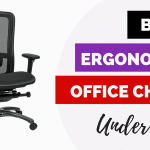 With that said, here are my picks for the 5 best footrests for under the desk you should consider in 2019 for your health. Each of them offer unique qualities that will cater to people with different needs, so be sure to read each review before making a decision. Happy Feet! Don’t be quick to judge this under desk footrest that may remind you of an inverted non-stick brownie pan. This Embody product is designed to tackle three important health aspects: posture, circulation, and reduced pain. Let’s start with the non slip surface, which is covered with bumps that give your feet a nice massage as you rock back and forth or run your bare feet across the surface. 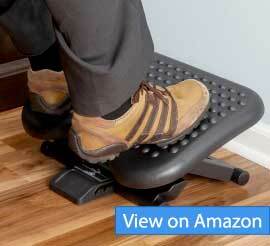 This encourages blood circulation in your feet and legs area, making sitting just a little more enjoyable. One of my favorite features of the Embody Care Under Desk Foot Rest is the high level of adjustments. This footrest is height-adjustable all the way up to 7.5”; for shorter people whose legs often dangle above the floor when seated, a footrest that can be raised up to meet your feet is critical, and this one does just that. Combined with the large angle adjustments, and you can easily customise this footrest to fit your specific sitting position. In fact, some people even use the Embody Care footrest as a wheelchair footrest. The Embody Care Foot Rest rocks back and forth as you rest your feet on it, which encourages active sitting where your feet are never still. The tilt angle cannot be locked however, which is probably a good thing so your feet are never stagnant. Made from plastic and rubber, this is a robust product that can be used on hardwood floor without scratching or sliding. While sturdy, the footrest is quite heavy and so isn’t as portable as lighter footrests. It is a good choice if you have an established workspace, a not-so-good one if you need to constantly move the footrest from place to place. Embody covers this product with a 90-day full manufacturer’s guarantee. 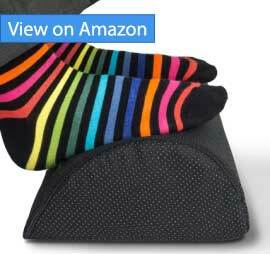 The company is very proud of its footrest, even claiming that it is “the Most Comfortable foot rest stool on all of Amazon”. 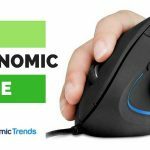 While we’re not ready to go that far yet, overall with its sturdy build, rocking feature, and large degree of adjustments, this is one of the best overall footrests for under the desk you can buy. Non-lockable tilt for people that want to lock in the angle of the footrest. Bottom Line: A modern looking footrest with 3 lockable positions for great ergonomics, though the non-adjustable height means short people may need to prop it up. The Eureka Adjustable Footrest is a great alternative to the Embody Footrest above for those looking for a more contemporary foot rest that looks great even in a corner office. 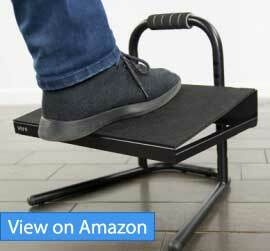 This is quality metal footrest that is not only sturdy, but looks and feels great to the touch. Like the Embody footrest, Eureka’s product boasts some textured grooves to help massage the feet. Besting the Embody product, however, the tilt angle of this footrest can be locked at three different positions, including completely flat to use it mainly as a massaging footstool. I love the rocking mechanics of the Eureka Adjustable Footrest when it’s unlocked- the amount of resistance is perfect, and really encourages active sitting without feeling like you’re trying to balance on a ball. The large flat surface area also makes it suitable for any kind of footwear, including high heels if you are a woman. Overall, the footrest is superbly built – a black rubber surface supported by a bronze metal frame for them professional vibes. The rubber-lined feet should prevent the footrest from moving on any surface. For eco-friendly buyers, Eureka notes that this product is made using environmentally friendly TPR rubber. The main shortcoming of the Eureka Adjustable Footrest is the lack of any height changes. When flat, it raises just below 4” off the ground, which for most people, including me (at 5’9”) works perfectly. If you are much shorter, however, you will need to either lower your chair or use some magazines underneath the foot rest to make contact with it. Not a big deal, but note mentioning. Bottom Line: One of the most affordable, hypoallergenic foam footrest that supports your feet wherever you are. Looking like a portable black JBL speaker that was cut in half, this footrest cushion really shouts comfort to your feet. Though non-adjustable like the Eureka footrest, the semi-cylindrical design of this footrest cushion allows users to put their feet at different positions and angles easily. For example, flip this footrest over, and it instantly becomes a rocker for your feet that encourages active sitting instead of just static support. Covering this foam footrest is a velour cover that is machine washable. 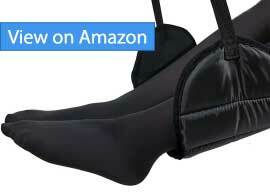 This lets you use any footwear on the cushion without fear of permanently staining it. I also love the treaded surface that is non slip, even on wooden floors, unlike many similar foam footrests. The Office Ottoman Foot Rest is both antimicrobial and hypoallergenic, something you definitely want in a footrest made of foam. This means the foam is resistant to bacterial growth, and also unlikely to cause an allergic reaction. Being around 1 pounds, this is a great footrest for not just the house or office, but in other unexpected places like in the car or even on the plane. The height of the Office Ottoman Under Desk Foot Rest is 4”, which is perfect for lower clearance desks and tight spots like in the car. If you are on the short side, however, a better option is the Ergonomic Innovations Office Footrest cushion below instead. 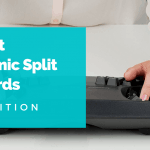 With a 30-day manufacturer’s replacement or refund warranty and a one-year warranty, this is an affordable speed bump (er, footrest) that is great for those who need ergonomic comfort on the go or in unconventional places such as the car or plane. Bottom Line: A taller version of the Office Ottoman footrest, this footrest also sports silicone dots that is even more slip resistant. 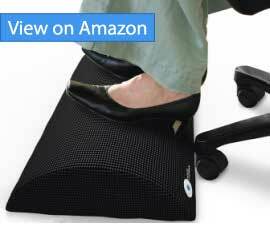 Ergonomic Innovations Office Foot Rest is very similar to the Office Ottoman cushion reviewed earlier, though stands taller at 5”, and is slightly heavier. This is the footrest to get if you are willing to sacrifice a bit of portability for a more hefty footrest. The surface of this footrest cushion is covered with silicone dots that help it stay in place even better on most surfaces. The textured surface also acts as massaging points for your happy feet that would make Mumble the Penguin proud. I’m a fan of the asymmetrically arched design of the Ergonomic Innovations Foot Rest. 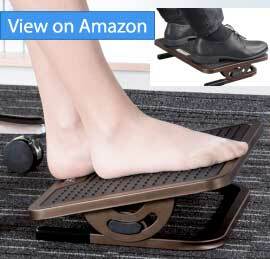 Not only does it provide my feet with a larger surface area to rest my feet on, the rocking motion when I flip it over for active sitting is also more pronounced. In general can’t go wrong with either the Ottoman or Ergonomic Innovations footrest. The deciding factor then should be whether 4” height is enough for your legs; if you need the extra 1” boost that the later provides, then the choice is clear. Machine washable, anti bacterial cover. Relatively heavy compared to other foam footrests, at over 1.15 pounds. Bottom Line: The best footrest for standing desks and short people, with a maximum height of 10.25” and ultra stable base. Ok, the Vivo standing foot rest won’t win any awards for beauty, though none of that really matters when it comes to ergonomics. And in that arena, this is one of the most stable, versatile foot rest I’ve reviewed. This is widely due to the unparalleled level of height adjustments of the platform, from 5” to a close 11”. Throw in an all metal frame that is as secure as any foot rest I’ve tested, and you are in good hands. There are several holes spaced along the handle that lets you adjust and lock in the desired height of the footrest. Kinda like how you lock in weights in exercise machines. At the lowest height setting of 5”, you can use this foot rest under the desk, though the lack of angle adjustment is a let down. Raise the platform up to its maximum setting though, and this becomes the ideal foot rest for standing desks. Take turns resting your feet on the large platform as you work, and notice just how much more mileage that gives you in terms of better blood circulation and being able to stand longer. The surface of the Vivo Standing Desk Foot Rest is textured to prevent your feet from sliding off easily. The width (depth) at 9.8” is large enough to comfortably accommodate most feet sizes, though I wish it was even deeper. As alluded to already, this is a hefty puppy, weighing close to 10 pounds. This is a consideration if you intend to use the footrest in different areas of your house or office. Assembly is super easy however, and requires no tools or manuals. Just fit the 3 pieces into place, and you’re ready to go. Very sturdy metal frame which should last a really long time. Greatest height adjustability range of any footrests we reviewed, making it ideal for shorter people whose feet often dangle from their chairs. Close to 11” maximum height makes it ideal to use with standing desks. Bottom Line: Ergonomic, all natural pinewood footrest that should last a lifetime if well cared for. Moving on from designs made of metal and plastic, we present a heavy duty plywood foot rest from Strongtek that in many ways is just as versatile, if not more so, than the more modern designs that proceed it. Made from natural Lauan hardwood plywood, this foot rest is really wide, measuring close to 18 inches in width to support a variety of sitting – and standing positions – as you rest your feet on the textured non slip surface. And that’s what makes the Strongtek foot rest so special. 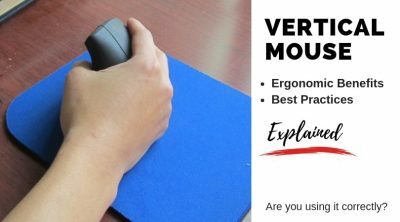 Not only can you use it as a traditional foot rest under your desk, you can also stand on it and rock gently as you’re standing, such as with a standing desk. The curved bottom lets you to constantly back and forth as you rest your feet, bringing much needed micro movements to your body. With a maximum weight limit of 350 pounds, the Strongtek footrest can go head to head with any aluminum or metal counterpart. 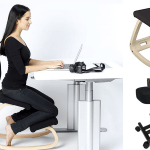 Acts as both a footrest and rocker to bring movements to your body as you sit or stand. Bottom Line: A highly portable and comfortable footrest for use on most planes. The Sleepy Ride Footrest may just be the perfect companion for your legs and feet on long hauled flights. Even before you arrive in Hawaii or Thailand, you can start enjoying a hammock-like experience with this footrest. Designed to work with most plane seats, the product works by using straps that you hang over the arms of the tray table in front of you. Whether the tray is upright or down doesn’t matter. The straps are adjustable, letting you shorten or lengthen it depending on whether you wish to dangle your lower leg or feet on the supporting pouch. Sleepy Ride claims that this item has been tested to prevent soreness and swelling caused by a sustained static position and blood pooling in the legs. Indeed many owners of this foot rest praise how much of a difference it has made on flights for their lower extremities. While this is a great foot rest on planes or even buses with trays behind the seats, how much benefit you will get from this product however is largely dependent on the amount of leg room available in front of you. In tight spaces, there just isn’t enough space for this footrest to work properly. Something to bear in mind. To maintain a natural posture, your feet should be positioned flat on the ground when sitting or standing. 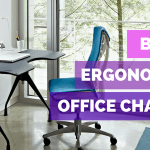 While good ergonomic chairs can accommodate different body shapes and sizes, most of them neglect your feet’s comfort and proper posture, to great detriment. Having an under desk ergonomic footrest complements your ergonomic chair by enabling proper foot posture and healthy blood circulation. Shorter people who are unable to touch their feet to the ground and instead let them dangle off their seats is just asking for problems down the road. The pooling of the blood in the lower limbs often lead to varicose veins and swelling, deep vein thrombosis, and muscle atrophy over the long term. Conversely, people who have to stretch to touch their feet to the floor can experience stress and strain on muscles, ligaments, and tendons in their legs, which can cause nerve pain. Even taller people who can touch their feet to the ground can experience varicose veins and muscle atrophy if their feet remain in the same flat position for a long time. Ergonomic footrests encourage healthier feet in both tall and short people, thanks to a combination of better support, massaging, and active sitting where your feet rock back and forth as you sit on the footrest. Changing the position of the feet using a footrest can maintain muscle tone – as you move your feet, the muscles in your legs contract and extend. This contraction and extension allows the skeletal-muscle pump to circulate blood from the lower limbs back to the heart. 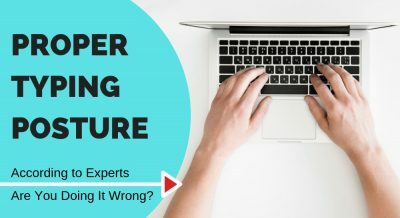 Moving your feet around can also prevent abnormal postures that can cause foot pain the same way maintaining a poor sitting posture can hurt your back. Footrests improve posture by raising the user’s knees above the hips, which help avoid stretching of ligaments and tendons that can lead to long-term problems. By raising the knees above the hips, the force of gravity that draws blood towards the feet is reduced. A proper posture also reduces the chance of injuries to ligaments, tendons, and muscles that can result in nerve damage. In addition to the above health advantages, footrests are especially beneficial for those who have had medical procedures done on their lower limbs. For example, people who have had hip replacements and knee or ankle surgeries will appreciate the extra support provided by a footrest because they don’t need to stretch their legs so out far to reach a solid surface. Moreover, ergonomic footrests can help these people maintain a normal position for their feet, which assists in the recovery process. Having established the importance of a good footrest, what exactl makes a good footrest? Many features in fact, which we’ll describe below. Ergonomically designed footrests incorporate features that help the feet conform to the footrest without making them uncomfortable. Textured surfaces (dotted or ribbed) that massage the feet can keep you comfortable and induce blood circulation in your lower limbs. Generally a footrest with a positive tilt is prefered over a flat surface. Being able to rock the footrest surface back and forth is also important, as it facilitates active sitting that keeps your legs moving and blood moving. If you are on the short side, make sure the footrest is actually tall enough to meet your feet. Many times you can prop it up with some magazines if necessary, though it’s better just to find one that works out of the box. Ideally a footrest that is height adjustable is best if you intend to use it with multiple chairs of varying heights. Since the footrest functions to elevate the ground to the user, the footrest should be sturdy. Robustness depends on the material (e.g steel, wood, plastic) or design (e.g. triangular or large bases or thick frames that increase the contact area with the ground). Regardless of the material, it should be able to endure sustained use without breaking. Being able to maintain its position on any floor surface is also crucial for a footrest – you can’t have it work on carpet and then move like a bowling ball on wood. Silicone or rubber surfaces on the bottom of the footrest can help anchor it in place even when you are putting your weight on it. 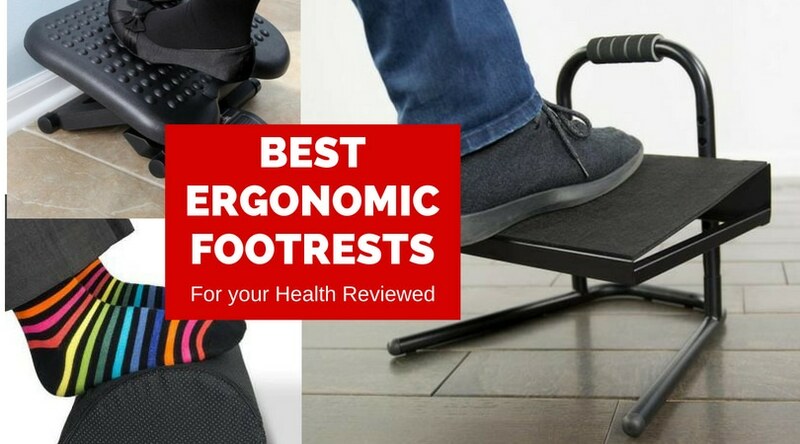 Whether it is steel, wood, or plastic, low-quality material can make your foot resting experience a short-lived one, even if the design is top-notch. It seems that design and material quality are intertwined, so having the best of both worlds is preferable – if it works for Hannah Montana, it will work for your footrest. You may have seen with the chairs we reviewed that footrests can have different functions outside of ergonomically supporting the feet. Case in point – the travel footrest. Portability can be a make-or-break feature for people on the go, so they will value product aspects like lightweightedness and small size and design, which allow them to take their footrests onto the plane or into the car. Versatility is an equally necessary feature – for example, being able to switch between rocking and non-rocking modes or having a clip-on sling that works for different plane seats are great aspects of a good footrest.